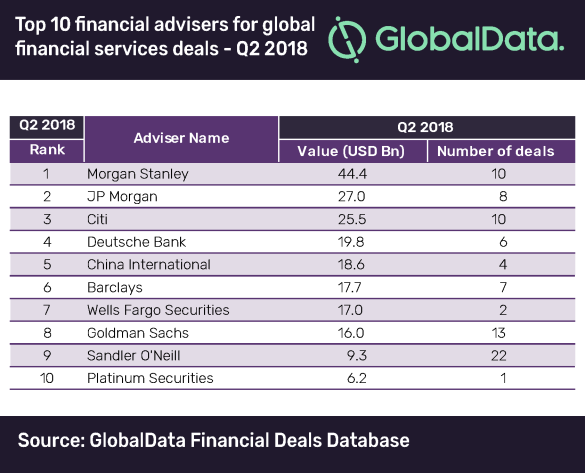 Morgan Stanley has topped the latest M&A league table of the top 10 financial advisers for the financial services industry for Q2 2018, compiled by leading data analytics company GlobalData. The bank lead the competition by value with 10 deals worth $44.4bn in Q2 2018, followed by JP Morgan with eight deals worth $27bn and Citi with 10 deals valued at $25.5bn. GlobalData compiles the league table using its own tracking data of all merger and acquisition, private equity/venture capital and asset transaction activity globally. According to the company, advising on the industry’s top three high-value deals during the quarter helped Morgan Stanley to achieve the top spot. The top three deals registered in the financial services industry during Q2 2018 were Capital One’s sale of $17bn worth of mortgages to DLJ Mortgage Capital, Ant Financial’s $14bn series C fundraising and Barclays Bank’s proposed acquisition of Bradford & Bingley’s $7.4bn worth of assets. In volume terms, Sandler O’Neill achieved the top position with 22 deals to its credit during the quarter, followed by Goldman Sachs with 13 deals. These two firms were ranked 9th and 8th by value, respectively. The global financial services sector witnessed a huge jump in M&A deal value of nearly 124%, from $39.9bn in Q2 2017 to $89.2bn in Q2 2018. In contrast, volumes grew moderately by 23% from 701 to 864 deals during the review period. Morgan Stanley was also the leading player in the global league table of top 20 M&A financial advisers released by GlobalData recently. JP Morgan, which stood second in the financial services league table, was the third leading financial adviser globally. 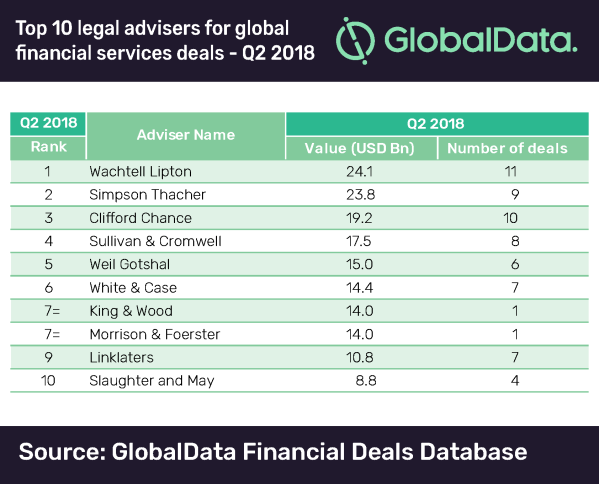 Being the sole adviser to the industry’s biggest deal during the quarter, Wachtell Lipton cruised to the top of GlobalData’s league table of M&A legal advisers in the financial services sector. With 11 deals, valued at $24bn, the company also achieved the highest deal volume during the review period.